Wishing “Happy Birthday” to a friend on Facebook is an important activity for few users. 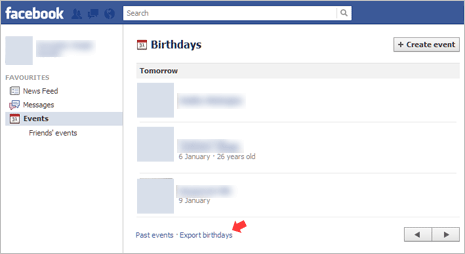 By default, Facebook show reminder for Today’s birthday along with friend name. You can simply click through friend name to get pop-up box for writing birthday message to that friend. What about keeping check on upcoming friends birthdays? 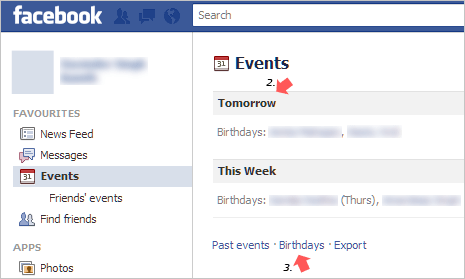 Fortunately, you can also track upcoming friends birthdays like tommorrow or this week easily on Facebook. 1. Open Facebook website and login into your Facebook account. Look for Events option on the left sidebar of the default Facebook home screen. Click Events option (with calendar icon) on left sidebar. 2. Events screen will show birthday information summary for friends birthday that are tommorrow and this week. You can click through friends name to view their profile (and may be wish ‘Happy Birthday’ in advance). 3. To view more detailed birthday information, click on Birthday option at the bottom of the screen. Here you can neatly view friends birthday details showing profile photo, profile name and birthday date. You can navigate birthday information month-wise using arrow buttons at the botton. You can also export to download and save birthday information to be used in different calendar application for easier tracking by clicking ‘Export Birthdays’ option.